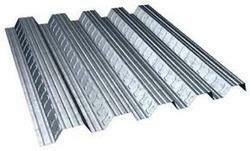 We are offering Galvanized Iron Sheets. Incepted in the year 1992, we “Garg Enterprises” are engaged in wholesaling and supplying a diverse range of Industrial Valves, Flange And Band, Water Meter, Industrial Roller Chain, Industrial Flanges, Pipes, Flow Meter, Level Measuring Instrument, etc. These are sourced by our skilled procuring agents from reliable and certified vendors of the market in compliance with defined quality standards. The offered products are manufactured using high grade raw material and cutting edge technology. The offered products are widely appreciated for high strength, compact design, high efficiency, corrosion resistance, easy installation and longer life. These are available in different specifications as per the needs of the clients.